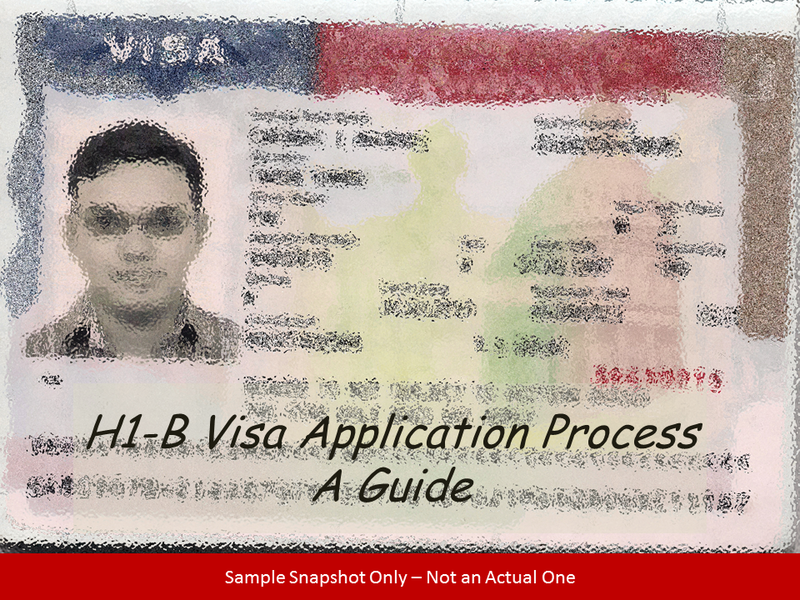 Contributions of experiences from other H1-B applicants did help me through my visa process and so after having collected my passport stamped with an H1-B, here I am adding my experience for those who are yet to go through this journey. Yeah spread over almost a year, it definitely counts as a journey in itself. It was sometime around December of last year (2013) when our immigration team informed that my firm had decided to process H1B visa for me this year and hence I was required to perform some formalities regarding the same. Yeah you guessed it right! Reading those lines was enough for me to jump around and shout out to everyone as anyone would expect I was at limits of my happiness – after all that is aim of every offshore professional in India right? [Kidding] And since then it has been a curios, anxious, boring, exciting and uncertain time with each emotion covering different phase of the process. The process ends today, when I have collected my H1-B Visa stamped passport from the US Visa Application Center. I have tried to cover various aspects of the process as a separate phase to cover as much information as possible. Around second week of December, we received an internal communication informing that the organization was planning to process our H1-B application this year. Organization had hired services of a law firm to support us through the process and we were required to fill in a few forms and provide relevant documents related to our professional and educational background to enable the law firm to prepare our petition. An informational call was conducted to introduce us to this category of visa and guide us through the process at high level. We complied as advised – who wouldn’t!! On April 2nd, we received a confirmation mail from the law firm informing that our petition was timely filed with USCIS and advised next steps of processing involved. We write to notify you that your H-1B cap petition was timely filed on your behalf. H-1B petitions are subject to the H-1B quota of 65,000 visas (for candidates holding bachelor's degrees or degrees from universities outside the U.S.) and 20,000 visas (for candidates holding master's or higher degrees from U.S. universities). From last year, USICS has started practice of subjecting petitions through a lottery, officially termed as Random Selection by USCIS, as first stage of elimination of applications. This year too, because the demand far outweighed the supply, all cap-subject H-1B petitions received between April 1, 2014 and April 7, 2014 were placed into a computer-generated lottery system. This year USCIS received abour 172,500 H1-B petitions out of which about 50% were rejected through this random selection process. On 18th of April, we received a communication from the law firm indicating that my H1-B petition was selected in the lottery process. At this time, we are very pleased to inform you that your petition was selected in the lottery and that your case will be processed in the coming weeks. This does not indicate that your H-1B petition has been approved, but merely that it has been accepted as a case eligible for processing. If your employer files for a premium processing (which costs an additional 1000$), which ours had, USCIS informs your law firm through an email which makes it much faster than the regular processing which is informed through regular mail. Premium processing petitions are handled at priority as there is a time restrictions for informing the results. Finally on June 5th we received an official confirmation indicating approval of our petition. On 06/05/2014, Your petition has been approved, and the corresponding approval notice has been sent to your employer. DS 160 Application – The first step to applying for a visa on based of an approved H-1B petition is filing of DS 160 form on the online portal of USCIS. This is mostly a straight forward form but needed some help from immigration team to clarify certain fields including work location and other details. Submission of Fees – This requires creating a second profile on another USCIS tool and submitting the relevant fees which is 190$ as of now for H1-B. This had to be paid in Indian Currency (~12000 INR) and we had three options to choose – pay at Axis/ Citi bank counters, transfer online or use vendor associated with the organization. I chose the vendor. Schedule Interview – Once the fees was submitted we were required to submit the receipt to the immigration team who coordination the scheduling of interviews. Once documents were submitted and request for appointment raised, we received the appointment letter from the immigration team with two time slots – one for fingerprinting and other for actual interview. Once interviews were scheduled, there was another session to guide us through the next steps and to give a flavor of what an interview is like. We were advised to be sure of all the information we had filled in DS160 and the petition and were asked to ensure that all information we provide is true to best of our knowledge. Here is how the things went on the scheduled days. This was the first of the two slots scheduled (20th August 2014 for me) when were to report at the Visa Application Center (VAC) at Nehru Place. This is located in International Trade Tower within Hotel Eros and is called American Plaza. It is located just besides the Nehru Place Metro Station and opposite Satyam multiplex and the location is well known by cab drivers in general. I had taken a cab and only thing that I needed to tell the driver as location was Visa offices in Nehru Place. If you come by Metro exit through gate number 2 and then walk right from there. It is a huge red colored building. The Trade Tower complex houses such centers for almost more than a dozen of countries and all are lined one after the other. The staff there is happy to guide you to your center though you would see groups already moving in the direction with the same petition as yours in their hands – following them works too! Officer – Good Morning. How are you doing today? Officer – What do you do for [employer name]? Officer – What are you job duties at that position? Officer – Where in US would you travel to? Officer – How much would you be paid? Officer – You have been to the US earlier. Officer (smiling and more of small talkish) – So you are familiar with the city? Officer – Your Visa is approved and you would get a message in a few days. This was it and I moved out by about 10:45 AM. Once I was back from interview the first thing I did was log into the embassy website to check my status. Ofcourse if could not have much information for me but still, now all I wanted was the stamped passport back to put an end to the process. All it said was – “ Your passport is with the consulate/ embassy” and the status remained same for almost about a week. This got me anxious as one of my colleague got his passport collection message the next day of his interview. But then I did not need my passport urgently and so waited patiently. Just kept checking the status every morning when I reached office. On 28th morning, the status showed that my passport has returned from consular area and is being prepared for delivery. Within next few hours the status changed to - “Your passport has been picked from embassy for delivery to your chosen pick-up location”. By next morning, August 29th it said – “Your passport is ready to be picked.” I never received any message but went into the Visa Application Center (Nehru Place) based on online status and they gave me my passport. The process was similar to the earlier one when I went in for fingerprinting. With this ended the journey of getting an H1-B Non-Immigrant Visa for six years (though initial stamp is for three years). Hope this post helps provide some context and help to all those who are yet to apply and go through the process. If you have any points of discussion, do pour them in the comments section. If you would like to discuss personally shoot a mail at kt@expressions-kt.in. If you have been through an interview – do post your experience in the comments section or send them to me and I would append with the post.